Our home galaxy, the Milky Way, is part of a collection of galaxies known as the Local Group. Along with the Andromeda Galaxy, the Milky Way is one of the Group’s most massive members, around which many smaller satellite galaxies orbit. The Magellanic Clouds are famous examples, which can easily be seen with the naked eye from the southern hemisphere. Together the nebulae are called NGC 248. They were discovered in 1834 by the astronomer Sir John Herschel. NGC 248 is about 60 light-years long and 20 light-years wide. 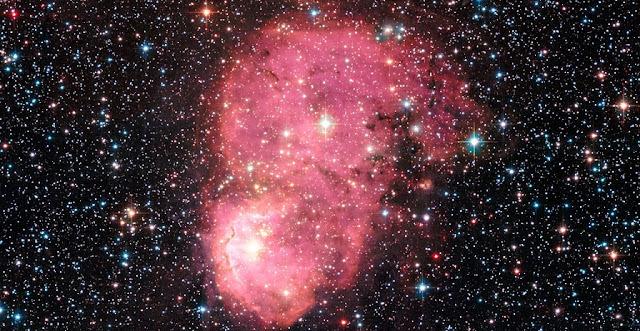 It is among a number of glowing hydrogen nebulae in the Small Magellanic Cloud, which lies in the southern constellation of Tucana (The Toucan), about 200 000 light-years away. The nebula was observed as part of a Hubble survey, the Small Magellanic cloud Investigation of Dust and Gas Evolution (SMIDGE). In this survey astronomers are using Hubble to probe the Small Magellanic Cloud to understand how its dust — an important component of many galaxies and related to star formation — is different from the dust in the Milky Way. The data used in this image were taken with Hubble’s Advanced Camera for Surveys in September 2015.